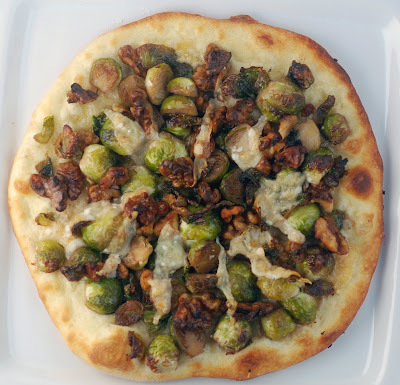 Another flatbread idea using walnuts, here surrounded by plump Brussels sprouts and gorgeous slices of parmesan cheese. The Brussels sprouts are sauteed in brown butter before loading them onto the dough. They're so tasty that any extra that you can't cram onto the flatbread make a perfect side dish. Heat oven to 325° and toast walnuts until fragrant, about 5 minutes. Remove and set aside. Raise temperature to 500­° to heat oven and pizza stone. Heat butter in saute pan over medium until browned. Add Brussels sprouts and saute briefly, about 1 minute. Add stock, toasted walnuts, a squeeze of lemon juice, and salt and pepper to taste. Cook until just tender. Roll out dough on well-floured surface (after letting it rest at room temperature for 15 minutes). Lighlty brush all over with olive oil, then add a layer of shaved parmesan. Top with Brussels sprouts mixture, then another layer of shaved parmesan (make a decorative pattern if you're so inclined). Sprinkle with a bit of sea salt. Bake until done, about 5 minutes. Watch closely to prevent the walnuts from burning. Great way to use Brussels sprouts! The crunch and flavor of the walnuts and salt of the Parmesan would go so well with them. Another of your winning flatbread combos! You're killing me! My favorite things all in one place, mmm. Another wonderful & very tasty flatbread!! I so love Brussels sprouts on everything! You and I love those brussels sprouts! I'm loving your flatbread posts. Who wouldn't want this for dinner! oooh...good call on the brussels sprouts! I love brussels sprouts, so this a lovely new way to prepare them. This weekend I picked up a few little Brussels Sprouts, I know what I'm making with them! I have all of these ingredients right now!! Awesome, I am totally putting my husband to work on Friday :) This looks delicious!!!! I'm loving your flatbread series! I think my favorite is still the Sorrel one, though the golden beets and chestnut honey sounds pretty amazing too. This one makes me actually WANT to eat brussel sprouts (and it's one of the rare things I'm not too keen on!). I hope you're adding these varieties to your restaurant menu! Brussels sprouts are one of my favorites. This looks great!